Update your drivers— If a controller is giving you problems, the first place to start is to check for driver updates for your manufacturer. I’ve covered this territory before in this book, so there’s no need to repeat how to do this kind of update here. I will say that older controllers may not have Vista drivers at all, or they may simply use native drivers built into Windows Vista. Go to your controller maker’s website and see whether a downloadable update is available. Check for additional utilities— Sometimes game peripheral makers offer bonus software to optimize or calibrate your controller or to program or customize controls. Check to see whether there is a version for your controller that works with Windows Vista. Clean and lubricate— Make sure your controller isn’t covered in game sweat. Clean it with a damp cloth and squirt a little lubrication between parts that move. A little WD-40 will go a long way to eliminate jerky movements. If you spill a sugary liquid on your controller (see Figure 1), one way out of sticky controller death is to unplug it and spritz it with water, especially if the spill gets into the control mechanisms. Afterwards, dry it thoroughly with a blow dryer. Repeat this several times if the stickiness remains. The idea is to dilute the sugar without soaking the peripheral. There is no warranty on this, however: Sometimes this works, and sometimes it doesn’t. Figure 1. 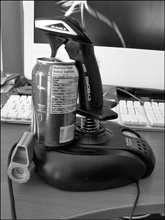 Your joystick is not a beverage holder. Type Controller in the Search box and click Game Controllers when it appears in the Start menu. 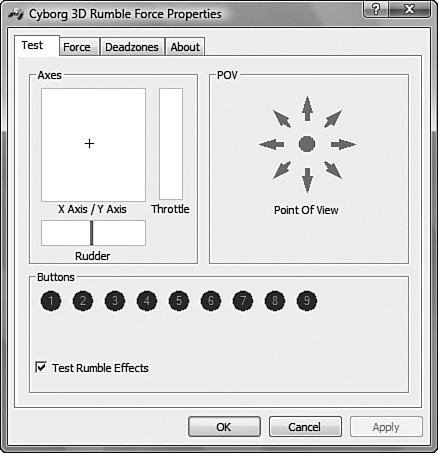 Select your controller from the box and click Properties to see the controls (see Figure 2) to adjust it. Figure 2. A visit to Saitek’s website resulted in a better Vista driver and controller applet for my four-year-old Rumble Force joystick. Click Advanced to select a controller that you want to use for older games.